Just 5 minutes' drive from Sydney International Airport, Quality Hotel CKS offers modern accommodation with an on-site restaurant. Enjoy a drink at the bar or make use of the internet kiosk. 40MB of free WiFi is available per day. 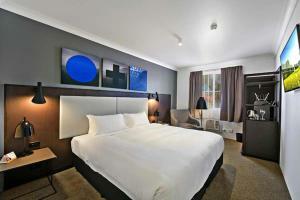 Quality Hotel CKS Sydney Airport is 5 minutes' walk from Cooks River and 400 metres from a train station. It is a 7-minute drive from the Sydney Domestic Airport terminals. For major attractions such as the Sydney Opera House, Sydney CBD is a 25-minute drive from the property. These air-conditioned rooms feature a private bathroom with a hairdryer and free toiletries. Each room has a TV and a refrigerator. The restaurant is open for continental or buffet breakfast. À la carte dinner is available. An airport shuttle is available for an additional charge. Important Information: Please note that the restaurant will be closed for dinner on Christmas Day. Please note that there is a 1.75\% charge when you pay with a Visa or Mastercard credit card. Please note that a 4\% charge applies for payments made with American Express and Diners Club credit cards. Transfers are available to and from Sydney Airport. These are charged AUD 7 per person, each way. Please inform Quality Hotel in advance if you want to use this service, using the contact details found on the booking confirmation." Please note that car parking is subject to availability. For additional parking and longer stays, charges apply. Guests planning to arrive by car are welcome to contact the property for more information using the contact details on the booking confirmation. Please note that a $100 credit card pre-authorisation or cash deposit is required as a security deposit upon check in. Please note this is a non-smoking property and all rooms are non-smoking. A security deposit of AUD 100 is required upon arrival for incidentals. This deposit is fully refundable upon check-out and subject to a damage inspection of the accommodation.